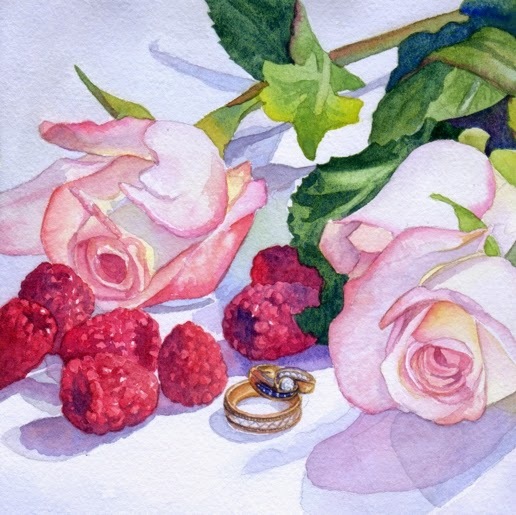 Day Twelve of the 30 Paintings in 30 Days and I painted "Roses, Raspberries, and Rings" because today is our 27th anniversary. Thank you to my amazing husband and father, Michael. Those 27 years have flown by and I can't imagine spending them with anyone else! This painting is not for sale. But, if you would like a keepsake for your anniversary, I could be commissioned to paint something like it for you. Contact me on my webpage here. Hi Lorraine, I have just discovered your blog via the 30/30 challenge. This painting is simply GORGEOUS! Such a pretty composition and so special because of what it celebrates. Happy anniversary! Thanks Wendy, I enjoyed painting it! Beautiful painting. Happy wedding anniversary to you and your husband.